Personalized Beer Cap Bottle Opener Magnets in Bulk. Cheap, Promotional, On Sale. 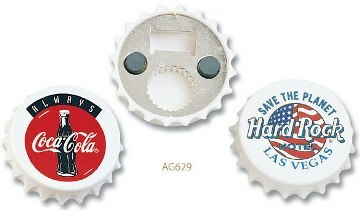 Wholesale Bottle Opener Magnets, Beer Bottle Cap shaped, Personalized. Inexpensive, Promotional. Both Twist-Off and Pull-Off. Budget Prices in USA and Canada. Bulk Personalized Magnetic Bottle openers, shaped like a beer bottle cap. It easily opens both beer and pop bottles with a sturdy metal lip. Our promotional Magnetic Bottle Opener also opens beer and pop bottles by twist action. The magnetic bottle opener doubles as a magnetic memo holder for your fridge! Free artwork design. We will send you a proof for your approval before production. Lowest prices in USA and Canada for wholesale personalized magnetic bottle openers. American clients pay no taxes. Basic unit price is for 1-color imprint. Add the amount shown for each extra color. You may order any in-between quantity. Please contact us if you require more details. Setup charge: $45.00 per color. Estimated Production: 7-10 days after art apprioval; Rush production is available: contact us. Use on both twist-off and pull-off bottle caps. Can also be used as a magnetic memo holder.